Elvis Presley Owned and Worn ARMY Jacket, Pants, and Hat (1960). The most famous US soldier of 1958-60 was one Sp4 Elvis A. Presley, previously and subsequently known as The King of Rock and Roll! As Jerry Osborne and Barbara Hahn document so well in their 2010 book Elvis: Like Any Other Soldier , Presley insisted on serving his country without special favors. Still these particular standard issue "summer dress greens" are special! Included here are Elvis' own jacket (38S), pants (29" x 32"), and hat (size 7), in pristine condition. 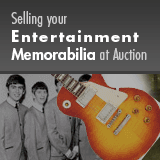 See more images of these items and of Elvis' ARMY days online at HA.com/7081. LOA from Patsy Presley Geranen.